Each resort has a restroom in their lobby, and most of the time they are uncrowded, very clean, and quite nice. The deluxe resorts are particularly nice with washcloths to dry your hands, and some other touches that reflect the deluxe nature of their surroundings. Some of these are tucked away a little so you have to be looking for the restroom to find them (which explains why they are uncrowded). And they are all nicely themed to that particular resort. The gift shop is not the only themed destination at the end of Pirates of the Caribbean . . . if you take a left as you exit and go down the walkway you will find some really nicely themed restrooms. These spacious bathrooms can take a larger crowd so you rarely find a line, and they are filled with details that make them seem authentic. The “hinges” on the doors, tile work and lighting all work together to remind you of the Pirates of the Caribbean. Located right in the heart of Harambe in Animal Kingdom’s Africa are a large set of bathrooms. While these do not get high marks for crowds (the area outside the restrooms is always quite crowded due to the entertainment and narrow area), they are very large so they can accommodate plenty of people. The reason this one makes the list is the door. Yes, the door. If you notice most bathrooms at Walt Disney World parks don’t have a main entry door, just an opening that curves around to the stalls. These restrooms in Harambe have a door for safety—it is a place to seek shelter in the event an animal might escape. Gonzo’s Royal Flush. That’s all I need to say. These restrooms are located on the side of the building that houses Pizza Rizzo just across from Muppet Vision. I think it is hilarious and perfect to the Muppet theming for these restrooms to be titled “Gonzo’s Royal Flush.” Outside there is lots of piping wrapping around the building—one can only assume that is Gonzo’s plumbing handiwork. When “New” Fantasyland was designed the area of Storybook Circus got a new theme thanks to the Imagineers. The Walt Disney World Railroad station became themed like a circus stop. The bathrooms here are large, a bit out of the way (since they are in the back), and usually very clean—all giving them high marks. The theme of the outside building as well as inside continue the fun. While it may look pretty generic as you enter, be sure to look down and notice the tile work on the floor—you will see the train tracks continuing right through the bathroom! This one is more for convenience sake than anything else. The restrooms around World Showcase can become crowded as exuberant guests eat & drink their way around the world. 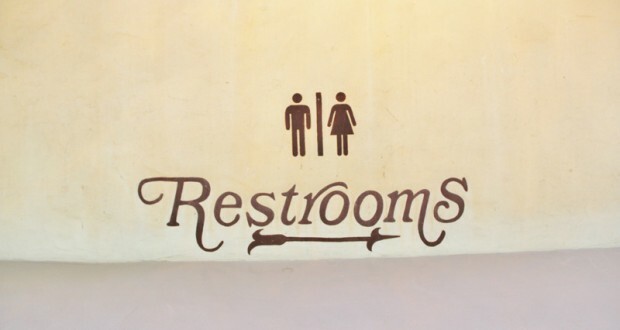 The restrooms in America are centrally located and they are large with two options—one near the counter service restaurant and a newer set to the right of the pavilion as you face it. The newer restrooms are nicely themed with Early American details like paneled stall doors, “wood” tiled floors, traditional brown & blue color scheme, an antique wallcovering and sconce lighting. Let’s face it, we all really prefer some privacy when we need to go. So one of the best bathroom choice is the one in your resort room. And Disney does a really good job making the bathrooms at their resorts fit the location. The Art of Animation bathrooms have great details tying the bathroom to the theme of the area. Many resorts have a shower curtain and tile work that is themed to the location. In the villas at Animal Kingdom Lodge’s Kidani Village there is a gorgeous tile design featuring the Lion King. The deluxe resort bathrooms have a luxurious, spa like feel. In fact, I will admit that I have taken photos of Disney Resort bathrooms to recreate elements in my own home. With the redesign of the Norway pavilion in Epcot’s World Showcase adding Anna & Elsa’s Sommerhus and The Wandering Reindeer shop, the bathrooms there also got a major upgrade. They are my favorite in World Showcase beginning with the adorable little Norwegian people on the signs outside the doors. The details on the inside are perfectly in tune with the pavilion with the cut out countertop edging, the large “hinges” on the painted doors, and the traditional Norwegian Rosemaling decorating the space. The wood tones of the walls and floors are very nice details too. Yes, the Tangled Restrooms. How could I not go with this option? But I think my favorite part is the music, so upbeat and just makes me happy. The outside of the restrooms has such an elaborate theme and setting with the lanterns, paintings, flowers, and buildings. The only downfall are the crowds since it doubles as stroller parking. Once inside Rapunzel’s paintings and other details make you feel like you are inside her tower, it is just beautiful. You need to visit . . . even if you don’t have to go. Thank you, Disney. Thank you for taking the time and effort to make your bathrooms beautiful and themed. It would have been so much easier (and cheaper) to make them plain, white tiled, normal public restrooms, but you didn’t. You went the extra 100 miles and made them so nice for us. And we appreciate it. Two more thoughts on Disney Restrooms: 1—notice how many of them have no mirrors above the sinks, so we don’t spend our time primping and building up a line? 2—Disney Rule #1, if one person has to go, everyone has to go! What do you love about Disney Restrooms?